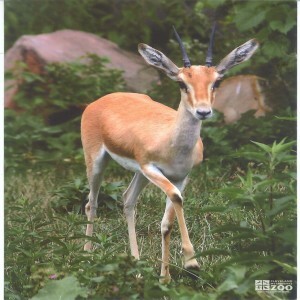 The range of the slender horned gazelle is Africa: central Algeria to Egypt. The slender horned gazelle inhabits desert and open bushland, from sea level to 19,000 feet. Slender-horned gazelles are generally found in groups of 10 to 30 females and their young. Males are found either in small groups or as solitary individuals. Lone adult males establish territories and have temporary control over females that enter their territories. Herbivorous grazers or browsers, they obtain most of their water from the plants they consume. They are strongly nomadic, their broad hooves enabling them to traverse deep sand dunes. Reproduction in slender horned gazelles is seasonal. Males establish territories in August and September, mating with groups of females that move through. The gestation period is 156 to 169 days. Births are in January or February, with normally a single offspring. Sexual maturity is attained in the second breeding season.